Pictured are Ronald Morrison, a beef cattle and hay farmer from Glenwood, at left, and West Virginia Commissioner of Agriculture Walt Helmick. GLENWOOD — West Virginia’s commercial industries could soon be expanding into the vegetable world, starting with farms in Mason County. The West Virginia Department of Agriculture and the West Virginia Conservation Agency piloted the state’s Potato Demonstration Product this year in the western region of the state. The departments are working in a joint effort with the Guyan and Western conservation districts. 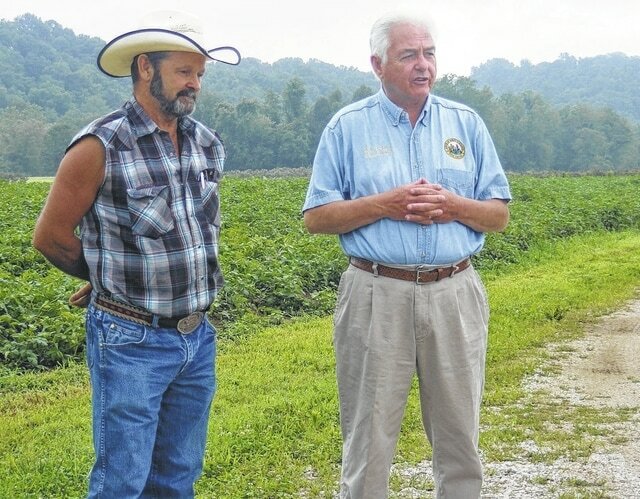 Walt Helmick, West Virginia commissioner of agriculture, said the state has a $6 billion gap between what people consume and what the state produces. The point of the project is to close this gap by creating more commercial agriculture in the state. He said the project is taking place in Mason, Jackson, Putnam, Cabell, Wayne and Lincoln counties. He said the WVDA chose these six counties to pilot the project because its members believe the area will be a good place for commercial agriculture to grow. The WVDA invited commercial buyers from wholesalers a Potato Demonstration Project Field Day on Wednesday. The buyers came to G&G Nursery in Mason County, one of the farms joining the program, to look at the farm and ask the farmers, as well as Rodney Wallbrown, Mason County Agriculture Extension agent for West Virginia University, and WVDA officials questions about the products and the program. Helmick said he also hopes the program will create jobs in West Virginia. He said over the years, some jobs have been lost in other industries such as coal, glass or steel, and wants to see the agriculture industry expand and open up new job positions for West Virginians. Local farmers also came out to the event to meet the buyers and learn more about what they are looking for in their products. Ronald Morrison, a beef cattle and hay farmer from Glenwood, is also joining in the initiative by raising six acres of potatoes this year. He said he hopes to see the project bring more income to West Virginia farmers. Helmick said the pilot program is set for three years, and he hopes to expand the program to other parts of the state in the upcoming years.